Pro as in projector? 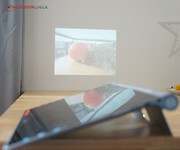 Lenovo shows its innovative side: The Yoga Tablet 2 Pro can be hung up on a wall, has an integrated subwoofer, and even a projector is installed. At a first glance, that is enough to provide a "wow" factor - but we will check whether the rest of the tablet is just as awesome. Lenovo has always treaded new ways with its Yoga tablets. We have already found the handy holding bar (cylinder) and fold-out stand awesome in Lenovo's Yoga Tablet 10 HD+. Lenovo has once again come up with some new ideas for its current generation. 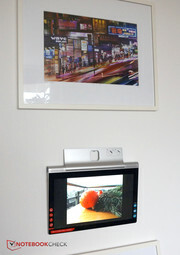 Have you ever wanted to hang your tablet on a wall like a picture? No problem, thanks to a completely foldable stand with a hole in the new Yoga 2 tablets. Lenovo has put even more effort into the 13.3-inch Yoga Tablet 2 Pro that we are testing today. 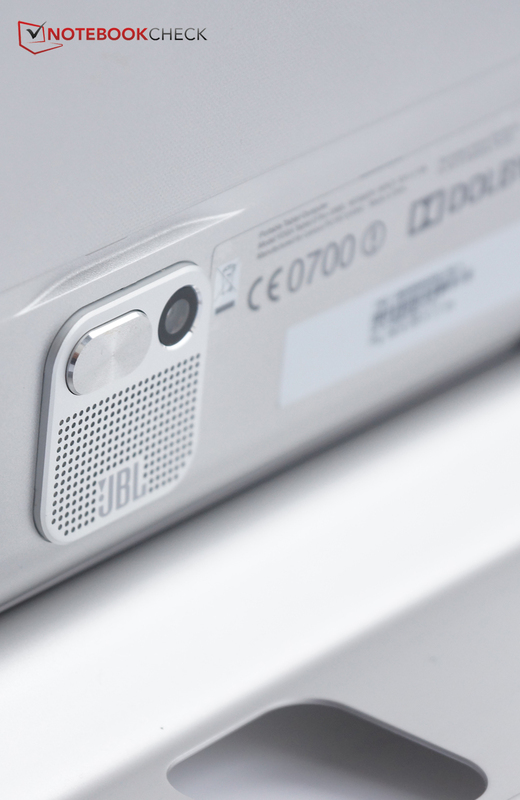 A QHD screen provides extremely high-definition images, speakers from JBL are installed for great audio, and there is even a subwoofer. But what is that in the cylinder on the tablet's right? A camera lens? No, it is an LED projector that enables projecting presentations and movies onto a wall. Despite all these cool features, we want to know just what the total bundle, selling for 499 Euros (~$620), looks like. 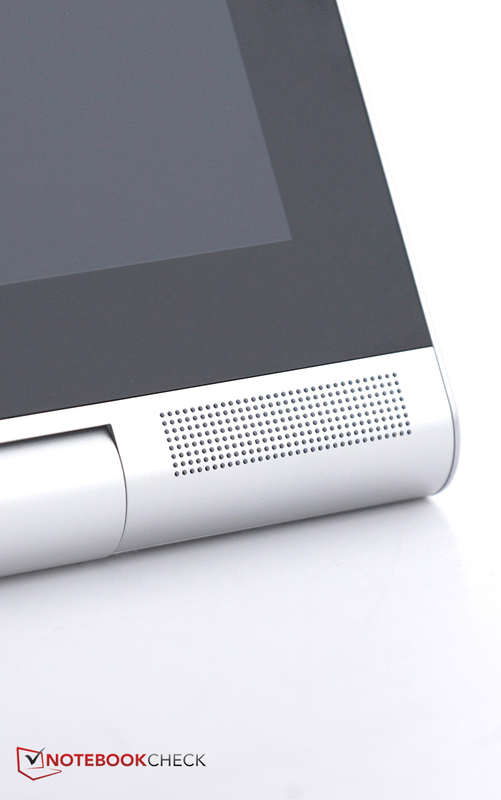 For example, does it still have the somewhat sluggish touchscreen that we criticized in Lenovo's Yoga Tablet 2? Or what about its weight? 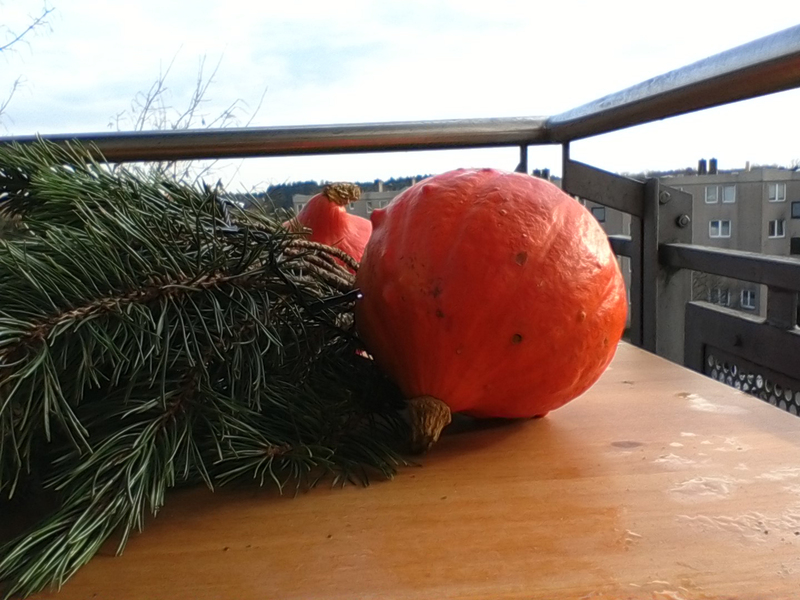 After all, we are dealing with an exceptionally large tablet here. The size is also the reason why it is difficult to find a direct competitor. We only have one 13.3-inch tablet in our database, and it comes from the rather unknown manufacturer Yarvik, and it is slightly smaller than Samsung's Galaxy Note Pro 12.2. 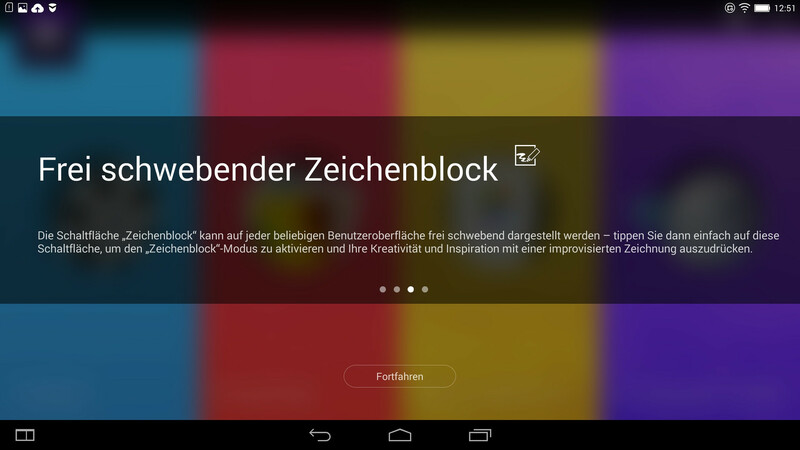 Otherwise, only 10.1-inch tablets, such as Sony's Xperia Z2 tablet or LG's G Pad 10.1 can be called upon. Asus' Transformer Pad TF701T, Apple's iPad Air 2 and Samsung's Galaxy Tab Pro 10.1 are also suitable for comparisons. Microsoft's Surface 2 is slightly larger than other tablets, but it has to live with the restrictions of Windows RT. 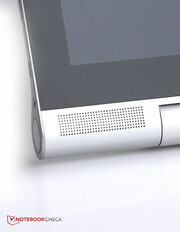 Is this a Lenovo Yoga Tablet 2 or a Tablet 2 Pro? To really impress your friends with your expertise, you would have to note that the Yoga Tablet 2 is considerably smaller at 8 or 10.1 inches than the 13.3-inch Pro version. You could also refer to the projector lens in the hinge and the subwoofer on the back. Otherwise, the family resemblance is, in fact, very evident. 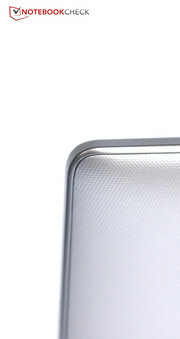 The casing is largely made of plastic; only the stand is aluminum. The design of the holding bar is unusual for a tablet, but it looks classy and has advantages from an ergonomic point of view. The bar gives the tablet a secure grip, and the lightly roughened back contributes to the Yoga Tablet 2 Pro's slip resistance when held. The casing's stability could be better. Pressure applied to the back is passed through to the screen, and becomes visible in the liquid crystals. Furthermore, the corners can be warped slightly. However, the overall stability should be adequate for everyday use, and the build of the Yoga 2 Tablet Pro does not at all give a cheap or unstable impression. 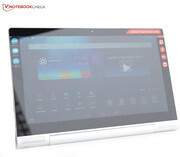 Anyone familiar with the name “Yoga” will know that Lenovo's tablet offers different operating modes. A button releases the stand, which is slightly stiff, however, it keeps the tablet firmly in position. The modes are "Hold" for holding the tablet in a hand, "Stand" that allows propping up the tablet, and "Tilt" where the tablet's angle on a table can be adjusted. This mode also makes the most sense when using the projector. The "Hang" mode is new, and is implemented via a simple hole in the tablet stand. It enables hanging up the tablet on a nail or screw on a wall. An integrated projector is a nifty thing. Integrating a projector in a tablet is indeed a unique idea. And one that naturally raises high expectations: Lenovo promises an image size of up to 50 inches on any suitable wall at a distance of two meters (~6.6 ft). 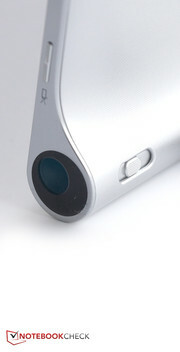 The projector is to produce a brightness of 40 - 50 lumens, and a resolution of 854x480 pixels. 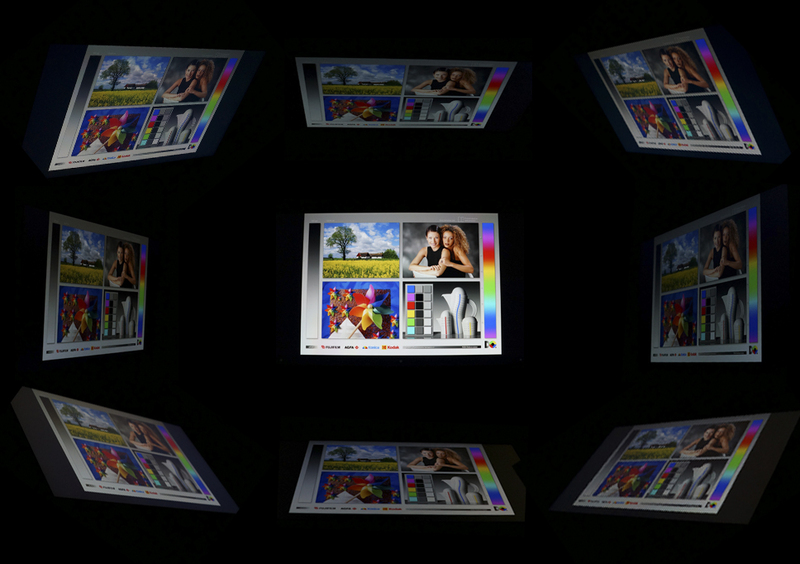 In fact, the projector delivers a sharp image, and the color reproduction is very compelling. The projector's low resolution is considerably less evident than on a screen when the source is a Full HD video. The image looks very sharp, and has the size of a large TV. Although the focus has to be adjusted manually, it is quite easy to do via the slider on the underside. The LEDs of conventional Pico projectors last up to 20,000 hours, which equates to over two and a half years of non-stop use. That should last the average service life of a tablet. In addition, the projector corrects image distortions via the position sensor. This projector is definitely useful and not bad compared with small stand-alone counterparts. 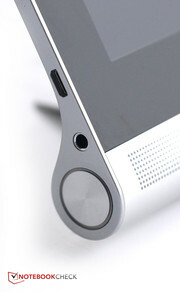 The other interfaces are rather standard: a micro-USB 2.0 port and 3.5 millimeter audio jack. The micro-SD slot for expanding the 32 GB of storage is a good thing. The Yoga Tablet 2 Pro comes with Android 4.4. The tablet will most likely be updated to the new Android 5 Lollipop at a later date. Lenovo has carefully modified Android. 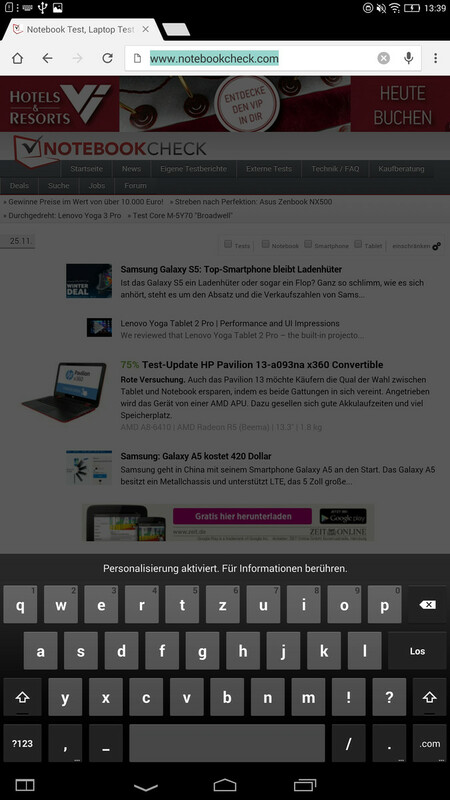 For example, all apps can be accessed by scrolling right or left; there is no overview of all apps. 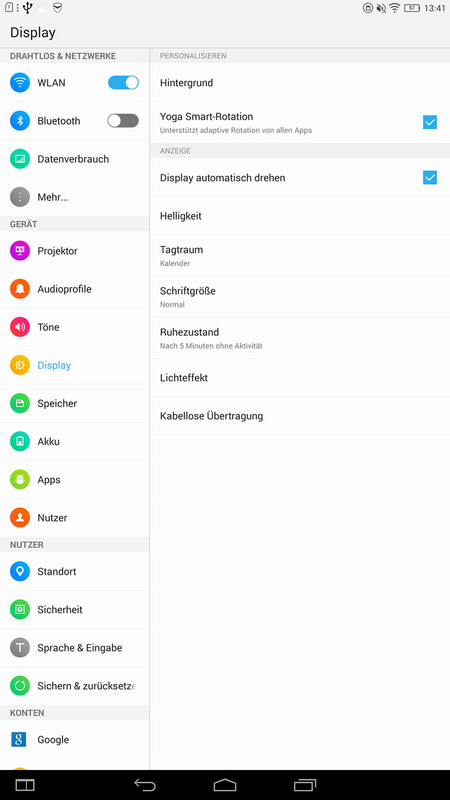 Lenovo has preinstalled some additional apps, such as "Security HD" that is to ensure the tablet's security, and also provides an ad blocker and a rights management for apps. "Sketchpad" allows adding floating sketches or notes over content, for example to mark important points during a presentation. The "Route 66" navigation software is free to use for 30 days. 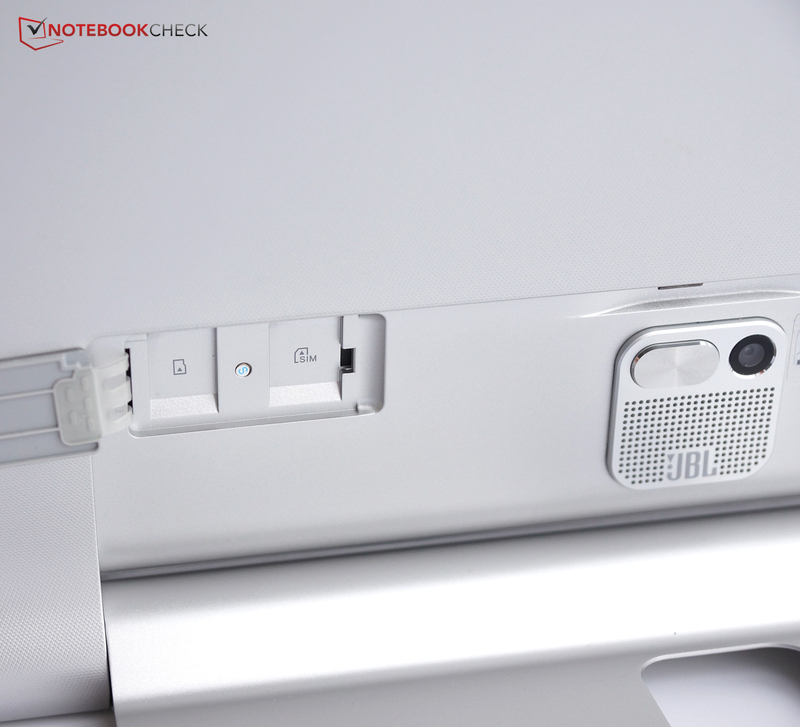 Lenovo's Yoga Tablet 2 Pro is well-equipped in terms of wireless communication. An 802.1 a/b/g/n Wi-Fi module is on board, and an LTE module for high-speed Internet on the go is an optional addition for an extra 100 Euros (~$125). It makes a maximum download speed of 150 Mbits per second and upload speed of 50 Mbits per second possible. Bluetooth 4.0 is also part of the bundle. The reception quality of both the Wi-Fi and LTE module is good. We still had the full signal and high transmission rates at a distance of ten meters (~33 ft) to the router and through three walls in the home wireless network. The signal dropped to 3/4 another two meters (~6.6 ft) away, and pages were opened slightly slower. Usually, we had a good reception, and an adequate data transmission speed in the rather moderately developed UMTS net of the German E-Plus provider in an urban area during mobile Internet use. Of course a GPS module is installed in the Lenovo's Yoga Tablet 2 Pro. The tablet could not be located indoors. 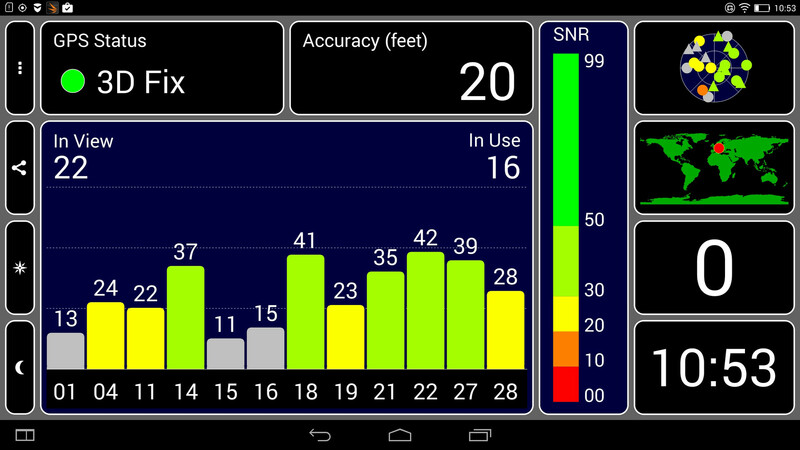 However, in the outdoors, a good signal was established within a short time and the tablet's position was tracked with an accuracy of seven meters (~23 ft). Accuracy is a tricky matter, as we experienced while taking the tablet for a ride on our mountain bike. 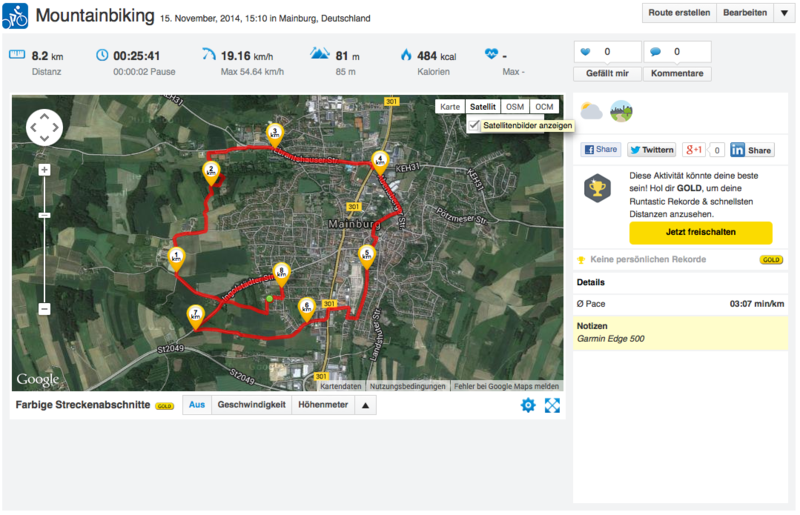 We also took the Garmin Edge 500 navigation system along. 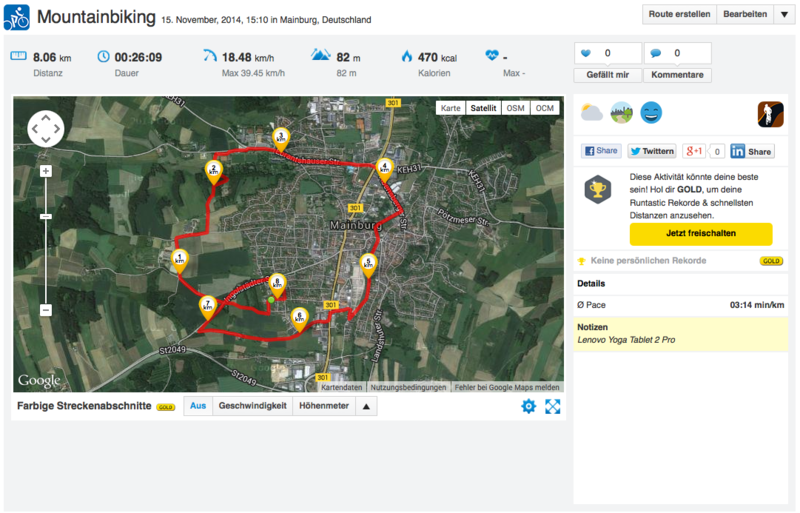 It determined the route with a considerably higher accuracy than the GPS module in Lenovo's Yoga Tablet 2 Pro. 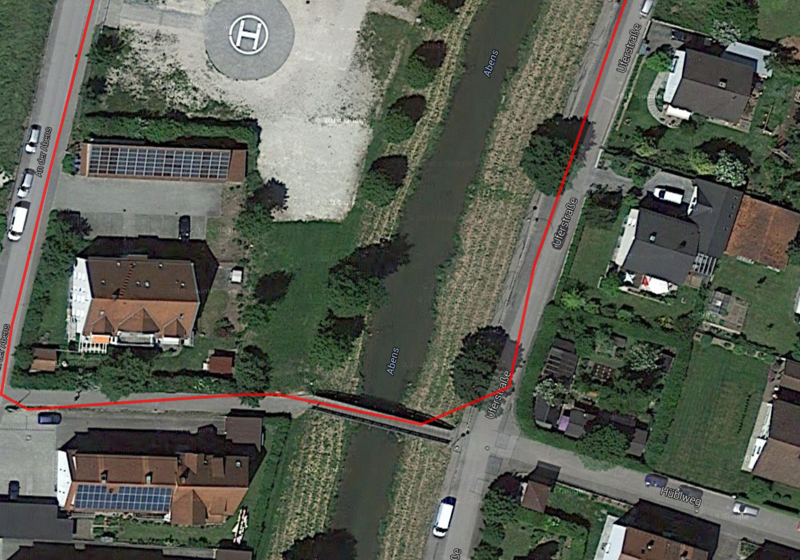 Although the length of the route only deviates by 140 meters (~460 ft), it becomes evident in the detailed view that satellite contact to the Yoga Tablet 2 Pro was recurrently interrupted. For example, the tablet did not even record crossing a bridge over a river. 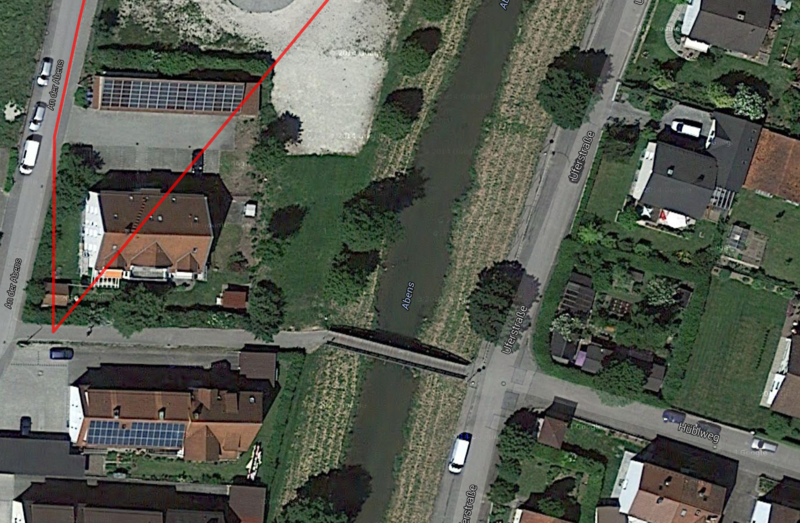 Instead, according to the GPS module, we hovered right across the water. 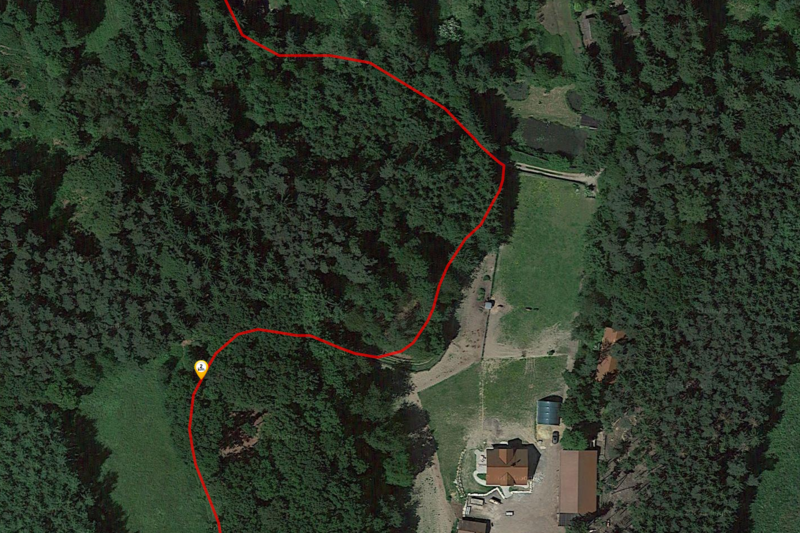 The Garmin Edge 500 tracked our route in the woods considerably more accurately. An 8 megapixel camera is standard in most mid-range smartphones. Acceptable lenses are only slowly moving into tablets. However, Lenovo's Yoga Tablet 2 Pro has a decent camera. This, as well as the subwoofer, is located on the back, protruding through a hole in the tablet's stand when it is closed. The camera proves that it can shoot quite reasonable pictures in our comparison screenshots. Details are not absolutely sharp when zoomed, but they are well-recognizable, and the colors look natural. A reflex camera of course does a better job with the sharpness of details and image composition, but the rear-facing camera in the Yoga 2 Tablet is quite satisfactory. 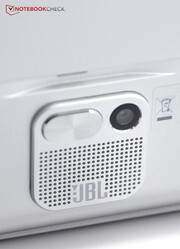 The front-facing camera has a resolution of 1.6 megapixels, and is not as good in color reproduction. It is nevertheless suitable for video conferencing. The box contains a tablet charger with the matching USB cable. Additionally, a wired headset with a decent sound is also included. 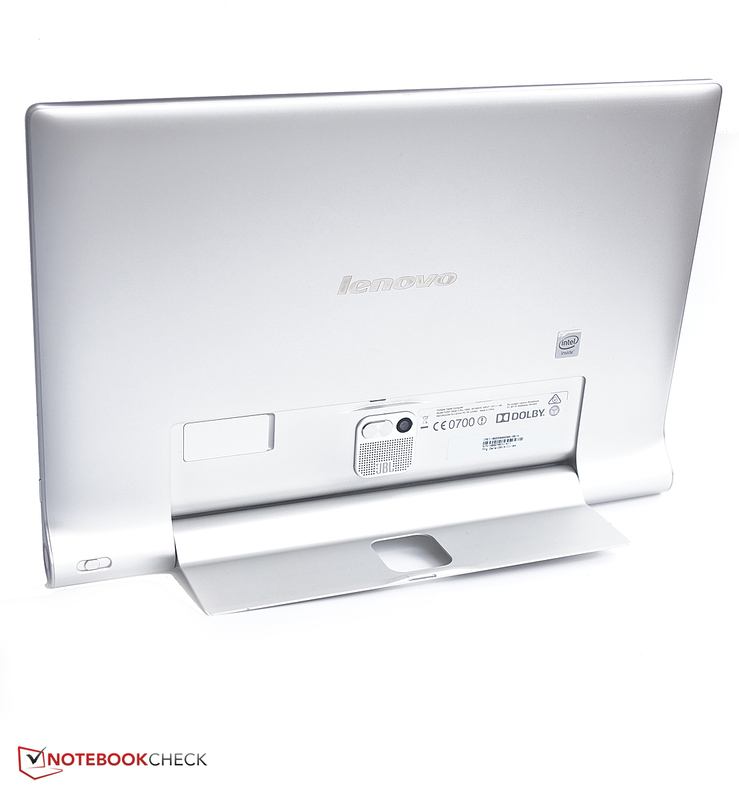 Not many Yoga Tablet 2 Pro specific accessories are currently available in Lenovo's shop. A folio cover for protecting the tablet is one of the highlights here, but it does not have a price tag as yet. Lenovo only includes a 12-month warranty on the tablet. Of course, the retailer's warranty is not affected by this, which is currently 24 months in Germany. Practical: Registering the serial number directly shows the remaining warranty period and what extra services are available. However, no warranty upgrade is offered for the Yoga Tablet 2 Pro. Fortunately, the Yoga Tablet 2 Pro has not inherited the problems we encountered with the touchscreen of the Yoga Tablet 2 10.1. The touch-sensitive screen responded reliably up into the corners, and implemented our inputs smoothly and quickly in all tested apps. The device also quickly detected and executed multi-touch gestures; the touchscreen can deal with inputs made by up to 10 fingers at the same time. 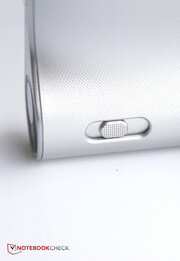 As to physical controls, there is the big power button on one side of the cylinder. Although people familiar with other tablets have to find it first, they will appreciate its size. 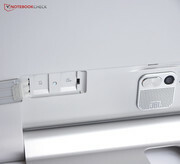 The volume rocker and projector button on the sides of the tablet, both have good pressure points, and are easy to find. There is a manual focus for the projector, which could be more accurate to use. 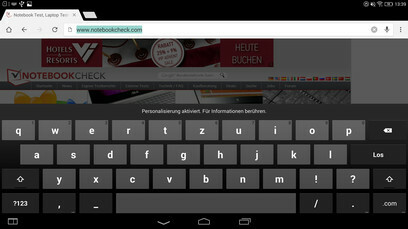 The virtual keyboard is the standard model from Google. The keys are large, and reliable to use. The keyboard is also very clearly arranged. A number row would have been nice, but an alternative keyboard can be downloaded from the Play Store if the standard model is found to be unsatisfactory. The screen in the Yoga Tablet 2 Pro has a QHD resolution of 2560x1440 pixels. As a result, many details become visible and images are displayed very sharply on the 13.3-inch screen, which is quite large for a tablet. At the same time, fonts remain legible due to the good scaling capabilities of Android. However, Lenovo's Yoga Tablet 2 Pro does not have the highest pixel density among the comparison devices because even smaller competitors, such as Apple's iPad Air 2, have very high resolutions. The screen in the Yoga Tablet 2 Pro achieves an average brightness of 382.8 cd/m². Although this is not bad, it is rather average among the comparison devices. The illumination of 86% is still within a good range, but brightness differences are visible to the naked eye on large, white surfaces. 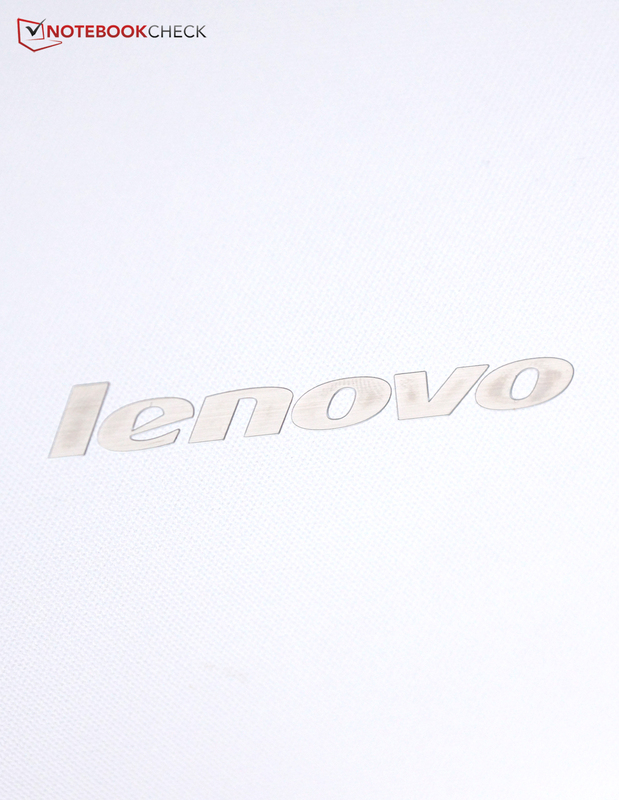 Lenovo's Yoga Tablet 2 Pro shows some shortcomings in contrast and black level. The comparison devices are considerably better equipped. Our review sample's black level of 0.65 cd/m² always displays black areas a bit too brightly, so that they appear rather dark gray. The contrast derived from the black level and maximum brightness is 615:1, and one of the lowest rates in the comparison field. Colors are not as bright, and look rather dull. 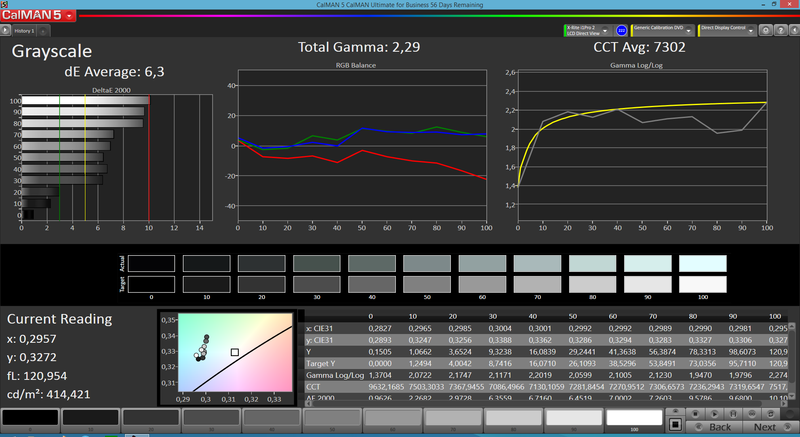 We examined the color reproduction more closely using the CalMAN software and a photospectrometer. The results are displayed in the screenshots below this paragraph. A clear tendency toward a bluish-green cast can, for example, be seen in light gray colors. 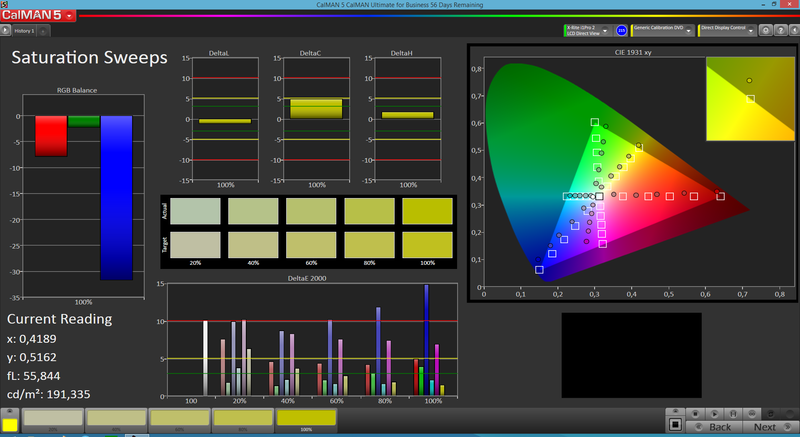 All colors deviate from the ideal rate of the sRGB reference color space either toward green or blue. Blue and very light colors in particular display a strong shift from the ideal so that the screen's color reproduction is unsuitable for professionals. 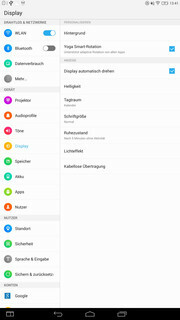 The retina screen in Apple's iPad Air 2, or the screen in Microsoft's Surface 2, for example, provide considerably more accurate colors in the test field. 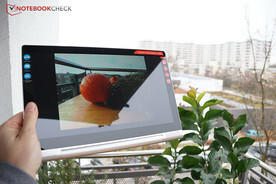 It is quite possible to use the Yoga Tablet 2 Pro outdoors - it has sufficient brightness, and therefore the content can still be recognized on the screen even on bright days. However, nothing is legible in direct sunlight because the screen is glossy. We did not have any problems with legibility indoors or in the shade. The IPS screen allows great viewing angles from all directions, and this advantage actually proves useful in Lenovo's Yoga Tablet 2 Pro. No matter from where or which angle we look at the screen, the content is always well visible. 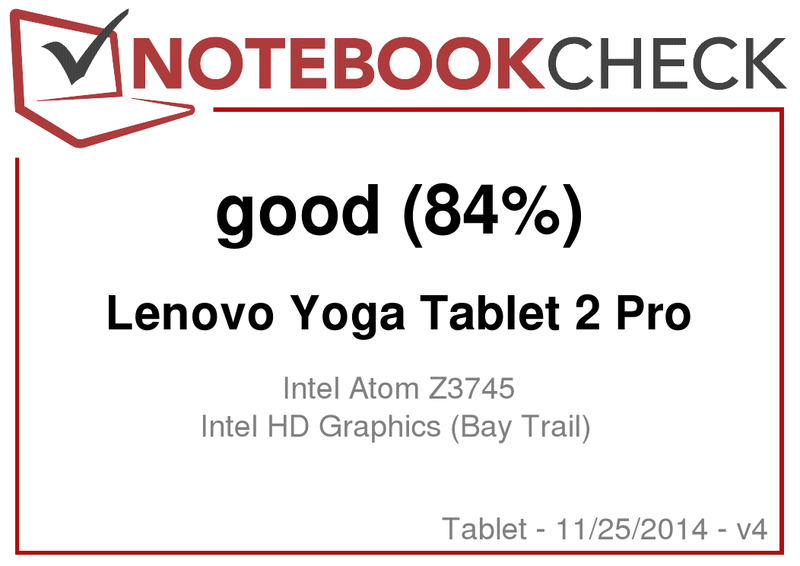 The Yoga Tablet 2 Pro uses the same Intel Atom Z3745 SoC as the Yoga Tablet 2 10.1. Its key specs are four processing cores and a clock of 1.33 GHz. We measured minor performance weaknesses in the Yoga Tablet 2 10.1, which were particularly prominent in the operating system's animations. Although they seemed slightly smoother in our present review sample, opening the multitasking screen in particular was still rather jerky. According to the synthetic benchmarks, the CPU's performance is largely similar to its smaller brother. The Yoga Tablet 2 Pro still cannot compete with the performance of Apple's iPad Air 2 or Samsung's Galaxy Tab Pro 10.1. Intel's HD Graphics (Bay Trail) is responsible for 3D performance. The graphics solution supports DirectX 11 and clocks with 778 MHz. The screen's resolution is already in the upper limits of the graphics card's capabilities. It should nevertheless be enough for most games from Google's Play Store. The different screen resolutions make the off-screen scores of the 3D benchmarks considerably more significant because the Full HD resolution is always used for rendering. Overall, Lenovo's Yoga Tablet 2 Pro does a decent job here. Its performance is in the middle of the comparison devices, and can clearly outperform some competitors, such as the Surface 2. We did not have many problems with the tablet's speed when browsing on the Internet. However, the presentation of sites that are not optimized for mobile devices sometimes stuttered. 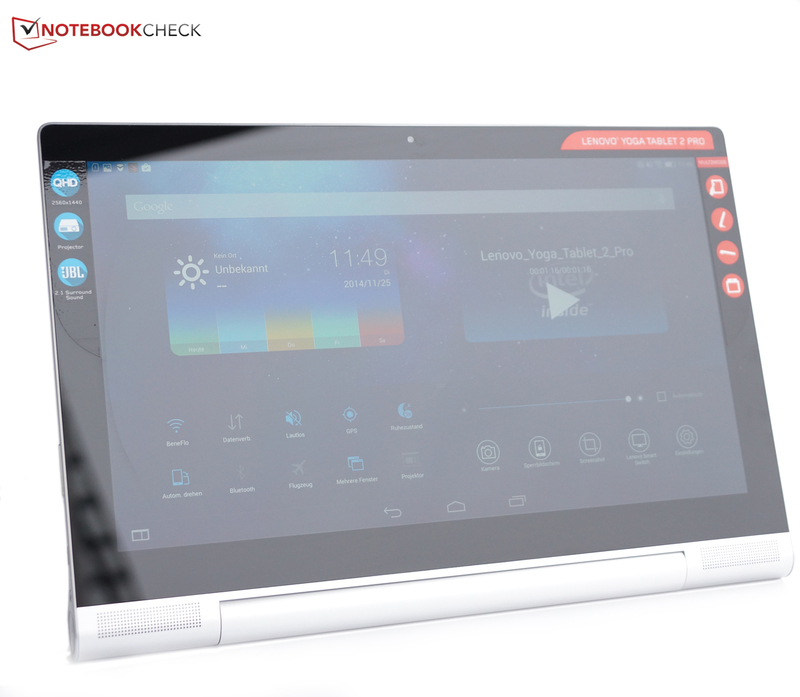 Lenovo's Yoga Tablet 2 Pro also achieved good results compared with similar devices in the synthetic benchmarks. 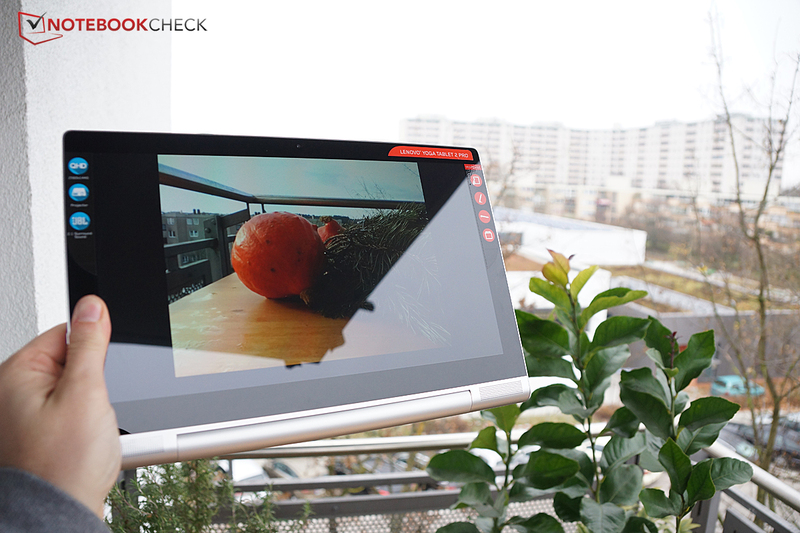 The 32 GB storage device in Lenovo's Yoga Tablet 2 Pro is relatively fast, as we determined in "AndroBench 3". The storage performed both sequential write and read faster than all comparison models. Only Sony's Xperia Z2 Tablet and Samsung's Galaxy Tab Pro 10.1 could keep up in random access. 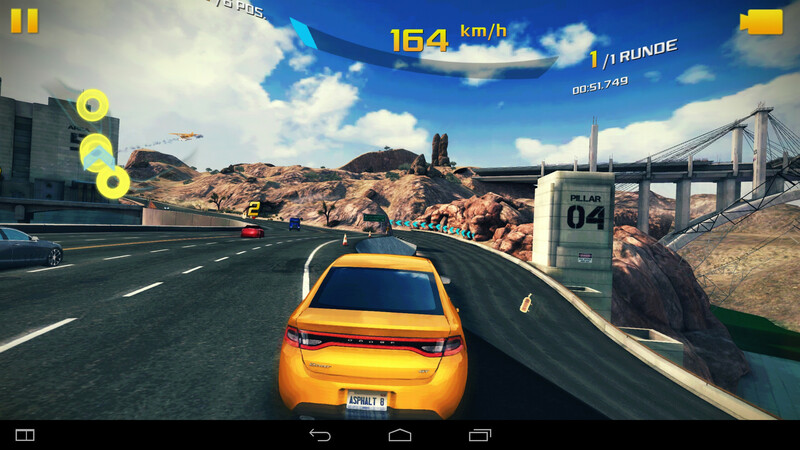 With 2560x1440 pixels, the resolution of the Yoga Tablet 2 Pro is quite high and pushes the graphics card to its limits in very sophisticated games like "Asphalt 8: Airborne". For example, lags are quite visible in landscape tracking shots and the cars in the race tutorial. There are fewer problems with the performance during the races, but details should be reduced to medium to be on the safe side. Less demanding games, such as "Angry Birds: Star Wars 2" run smoothly, and the graphics card has to be challenged to quite an extent before the performance drops noticeably even in this resolution. However, users should not rely on the graphics card's future viability too much. It is very possible that Intel's HD Graphics (Bay Trail) will no longer be able to keep up when the graphics of games become more complex. 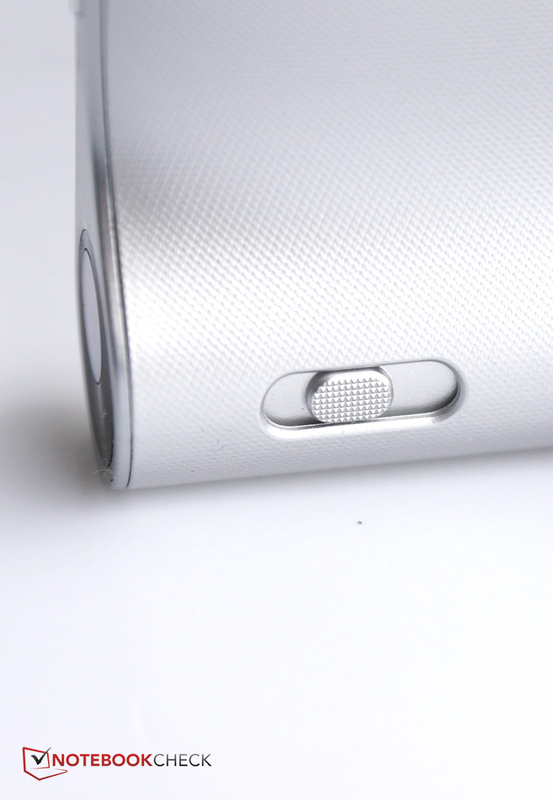 Increases in the casing's temperature are barely noticeable. The casing never exceeds 33.4 degrees Celsius (~92 °F), and the tablet can always be held comfortably. The temperature differences between load and idle mode are also quite low. The lower front left and the corresponding area on the back heat up the most. Only a very slight warming is felt when the tablet is touched here. Thus, users will not have problems with too high temperatures in the casing. (+) The average temperature for the upper side under maximal load is 28.9 °C / 84 F, compared to the average of 30.7 °C / 87 F for the devices in the class Tablet. (+) The maximum temperature on the upper side is 33.4 °C / 92 F, compared to the average of 34.8 °C / 95 F, ranging from 22.2 to 51.8 °C for the class Tablet. 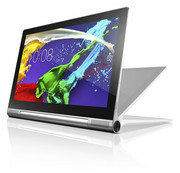 An 8-Watt sound system with front-facing JBL speakers and a subwoofer, Master Hi-Fi audio processing, and Dolby support - Lenovo naturally sparks high expectations for the sound of the Yoga Tablet 2 Pro with such statements. In fact, the sound system proved capable of fulfilling these expectations, at least to a large degree. Overall, the maximum volume is quite high, the sound is present, rich and balanced with actually audible low pitches. 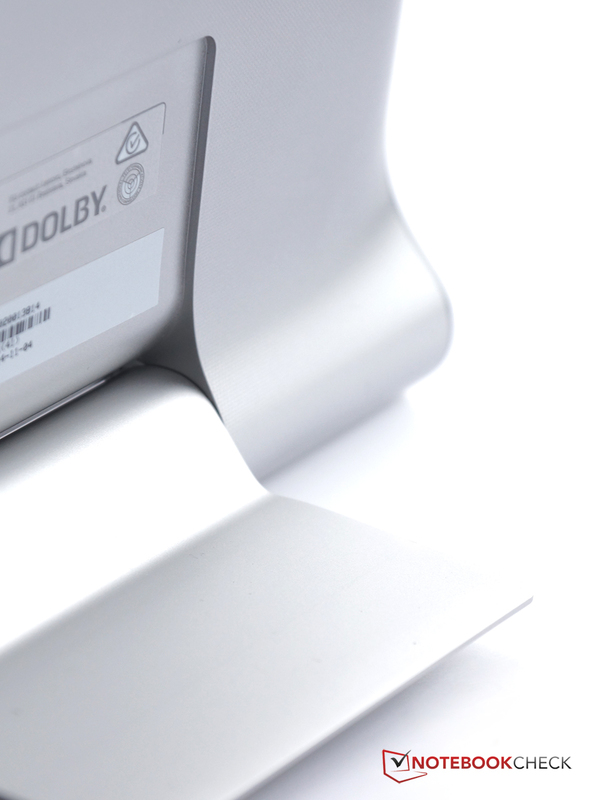 The sound does not distort even at maximum volume, but it becomes evident that the speakers' granularity could be better when listening to a big orchestra. 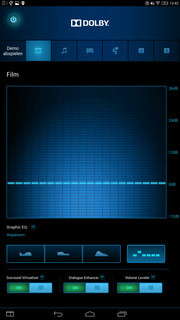 The app "Dolby" allows adjusting the sound in detail via presets or personal settings in the equalizer. 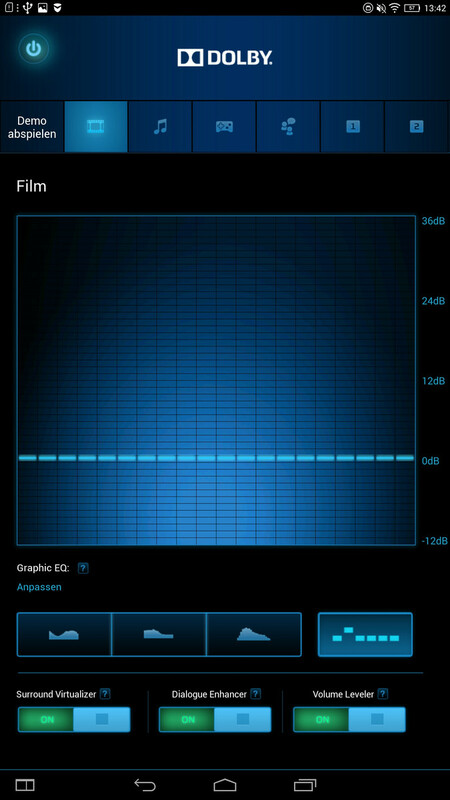 In fact, it changes something in the sound, and the speakers would sound thinner without the app. Overall, the Yoga Tablet 2 Pro sounds very good for a tablet. In conjunction with the projector, it creates a very decent home entertainment center. Nevertheless, an audiophile will prefer using a headphone or external speakers. The comparatively large screen of the Yoga Tablet 2 Pro naturally has an effect on power consumption. This is particularly noticed in the idle consumption. The Yoga Tablet 2 Pro needs a minimum of 2.6 Watts to operate without load. It can even be as much as 7.7 Watts while idling. However, this can be exceeded by, for example, Samsung's Galaxy Tab Pro 10.1. On the other hand, the tablet proves to be surprisingly frugal during load when compared with many 10.1-inch rivals. However, some also have a higher performance. We measured a maximum consumption of 9.9 Watts. 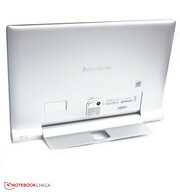 Asus' Transformer Pad TF701T consumes considerably more with 16.6 Watts. The projector is not power hungry either. The tablet automatically reduces the screen's brightness when it is turned on. This has two advantages: First, the power consumption is lowered, and second, the screen's light emissions are reduced, which makes the projected image look brighter. The power consumption is considerably higher than that of the smaller Yoga Tablet 2 10.1 with the same SoC. However, the battery's capacity of 9600 mAh or almost 36 Wh is identical to that of the smaller model. Consequently, the Yoga Tablet 2 Pro cannot achieve the superb runtimes of its smaller brother. Nevertheless, it clearly exceeded the battery life of some devices like Asus' Transformer Pad TF701T or Microsoft's Surface 2. For example, it is possible to surf on the Internet via Wi-Fi for 9:44 hours. Watching five, slightly long movies from the tablet's flash storage should not be a problem either. Altogether, these are very good runtimes, which are surely due to the high-capacity battery, and prevent the size of the Yoga Tablet 2 Pro from being a drawback. In review: Lenovo Yoga Tablet 2 Pro. 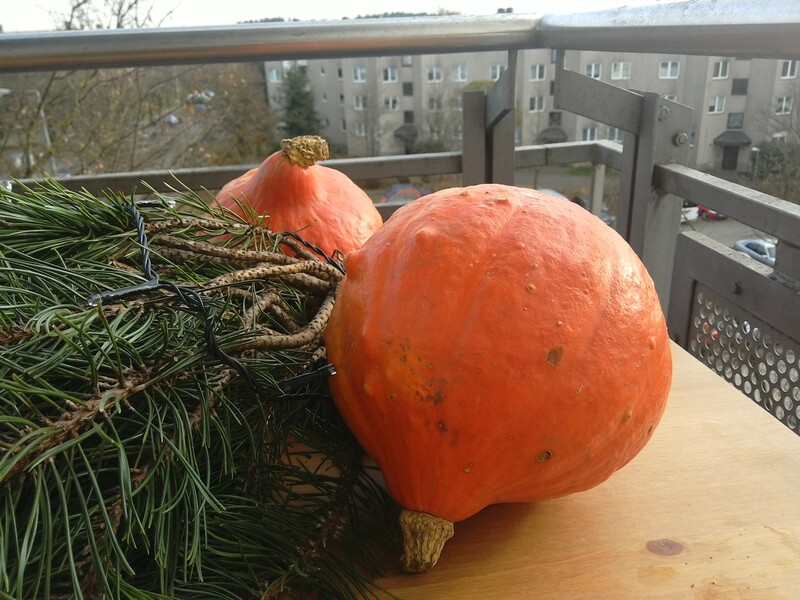 Review sample courtesy of Lenovo Germany. 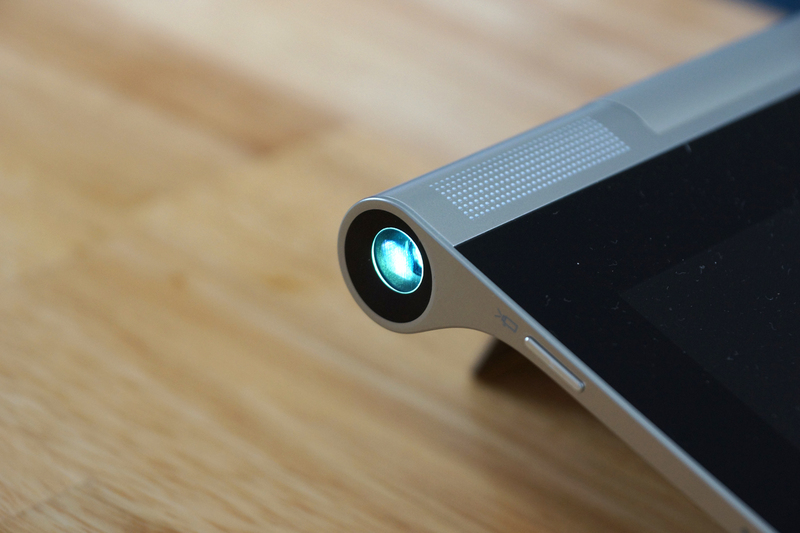 The "wow" factor is quite large when hearing the configuration of Lenovo's Yoga Tablet 2 Pro for the first time: a projector, a brand name sound system, a decent camera, and a high-resolution screen. It is a great credit to Lenovo that it manages to fulfill many of the high expectations for a relatively moderate price of 499 Euros (~$620) for the Wi-Fi version or 599 Euros (~$745) for the LTE version. The projector proves to be very useful, and is a great alternative for a movie night on the go. 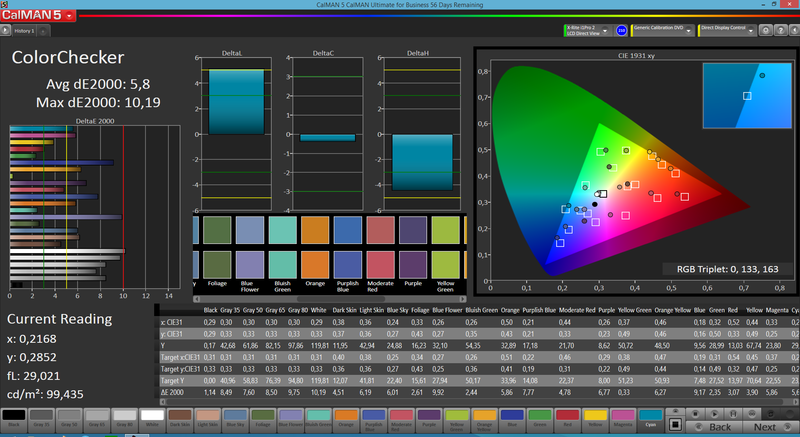 Viewers will like the color reproduction and decent brightness. Although the sound system cannot match gaming laptops or high-quality home speakers, it does provide an impressive sound for a tablet that makes the projector into an everyday suitable home entertainment center. 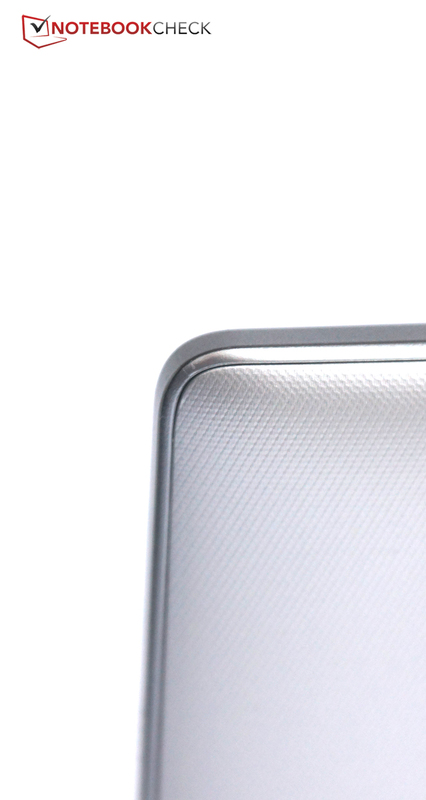 The holding bar (cylinder) prevents the Yoga Tablet 2 Pro from passing as slim, but it has many practical advantages. The incorporated stand is just as great a feature as the holding bar itself that gives the user a secure grip. A second small TV becomes superfluous because the Yoga Tablet 2 Pro can even be hung up on a wall. Lenovo does not run out of good ideas and implements them consistently, which is remarkable in itself. The high-resolution screen could perhaps be slightly more color accurate, the stability is not perfect, and the GPS is definitely inaccurate. The SoC offers mid-range performance - occasional lags are daily routine but they are tolerable. The battery life is good in practice, the casing barely heats up, and the software and handling are decent. The Yoga Tablet 2 Pro just has to be loved for the fact that it tries out new things, and implements them well. But its everyday qualities have not been forgotten. Users who do not find a 13.3-inch tablet with a weight of almost one kilogram (~2.2 lb) too bulky, will get an innovative and reliable device that allows them to make an impression on others. Lenovo's Yoga Tablet 2 Pro is definitely something special. Is it due to the build? It is decent, but not outstanding. Is it due to Intel's SoC? No, that's known from many other devices. Perhaps it's due to the holding bar (cylinder)? Yes, that is special, but other Yoga tablets also feature that. Now we've got it: The Yoga Tablet 2 Pro has an incorporated projector - wow! 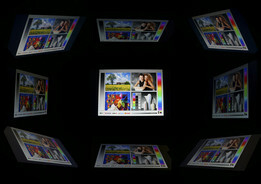 It projects pictures with up to 50 inches in diameter onto a wall. Not enough special features? There is also a 2.1 sound system. JBL supplies the components for that. The sound is in fact quite impressive for a tablet. Audio settings can be changed via the "Dolby" app. A subwoofer is on the back, just like the 8 megapixel camera that shoots decent pictures. Also on the back: An incorporated stand. Maybe a bit too stiff, but stable in return. If that is not enough, the tablet can be hung up on a wall as the peak of eccentricity. Otherwise, there is a QHD screen with good brightness. 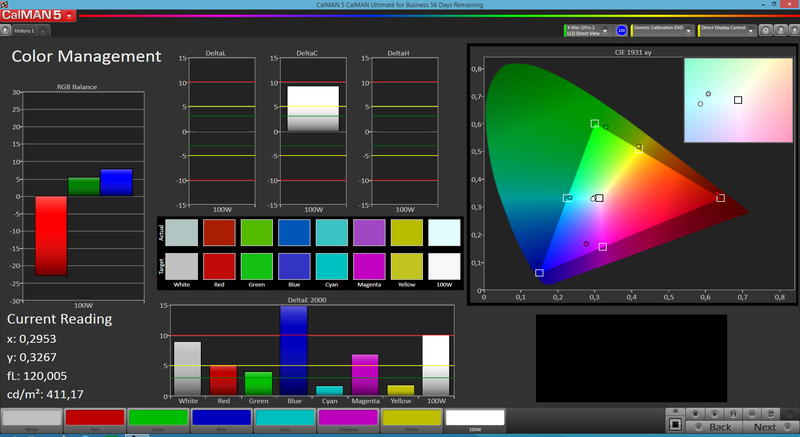 The screen would however need more color accuracy or an adjustable white balance. The Yoga Tablet 2 Pro is also optionally available with an LTE module. 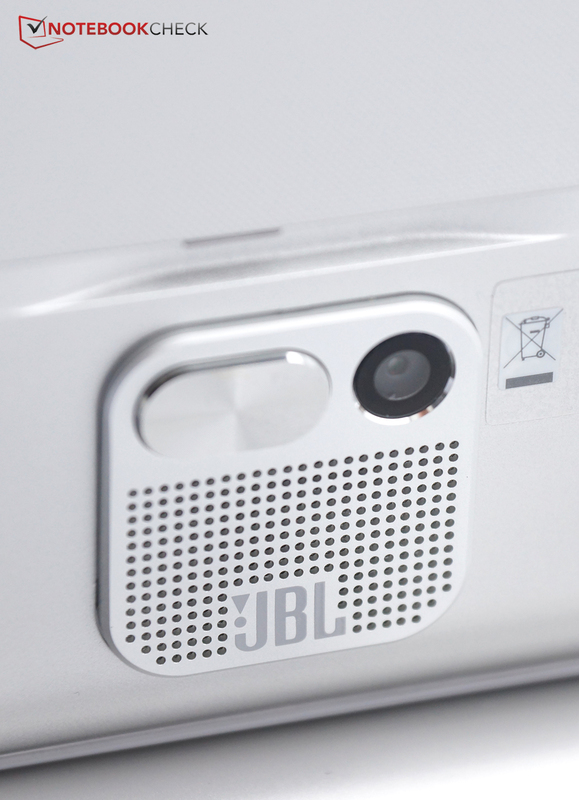 The front-facing camera is sooner suitable for videoconferencing than making calls. Interesting additional features are also found in the software, such as free-handed sketching on the screen. Lenovo delivers an extraordinary tablet that offers great features. The flexible concept and the innovative ideas. The high-resolution screen's color reproduction could be better, and the casing could be a bit stiffer. That hardly anyone has had the idea of incorporating a projector until now - great idea. Lenovo Yoga Tablet 2, Yarvik Xenta 13c, Sony Xperia Z2 Tablet, LG G Pad 10.1, Asus Transformer Pad TF701T, Apple iPad Air 2, Samsung Galaxy Tab Pro 10.1, Microsoft Surface 2.